Cytogenetic studies can be carried out on metaphase chromosomes or on interphase cells. Besides the classical techniques, many new methods, based on molecular ap­proaches, are now available. About one-third of oocytes are cytogenetically abnormal. This percentage increases with maternal age. Most abnormalities are caused by non disjunction, but premature centromere division at meiosis-I (M-I) has been suggested as an alternative mechanism.. In sperm cells about 7% show abnormalities. This percentage is higher in infertile males. About a third of morphologi­cally normal embryos are chromosomally abnormal at the cleavage stages. In human blastocysts chromosomal mosa­icism arises. During preimplantation development, the percentage of embryos showing chromosomal mosaicism increases to almost 100% at the blastocyst stage. The most common abnormality in miscarriage is trisomy. Trisomy 16 accounts for 30% of all trisomies. 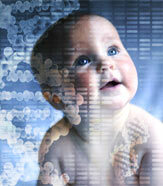 Trisomy for all chro­mosomes except chromosome 1 has been observed in spon­taneous abortions. Autosomal monosomies are practically unknown in human miscarriages, but monosomy X is a frequent finding. The abnormality most frequently result­ing from abnormal fertilization is triploidy. Key words: Chromosome abnormalities, Preimplan­tation embryo development, Spontaneous abortion, Non disjunction.